If you’re an active traveller and looking for fun things to do in Amsterdam, there are plenty of activities and attractions to visit. While nighttime means slowing down in other places, the darkness infuses even more energy and a heightened sense of adventure to this capital city of the Netherlands. The Amsterdam Nightlife Ticket provides 2 days unlimited access to 25 + clubs, nightlife experiences and drinks for just 10 Euro. Make sure you check it out! From exploring world-renowned museums to experiencing the nightlife and discovering the elaborate canal system, you are assured that there is no shortage of fun things to do in Amsterdam at night. Built in the 17th century, Amsterdam’s canal ring is made up of a complex of waterways surrounding the Old Town. The canal ring district has been included in the UNESCO World Heritage list because of its immense historical and cultural merit. Exploring the canal ring will be an adventure in itself – you will have numerous special events, festivals, pubs, restaurants, museums, and canal cruises in the area to choose from. Experience the sights and sounds of Amsterdam from the water, as you go on a canal cruise while enjoying a sumptuous dinner and a few drinks. You have the choice of taking in the nighttime view inside from the lower saloon or the outdoor deck. 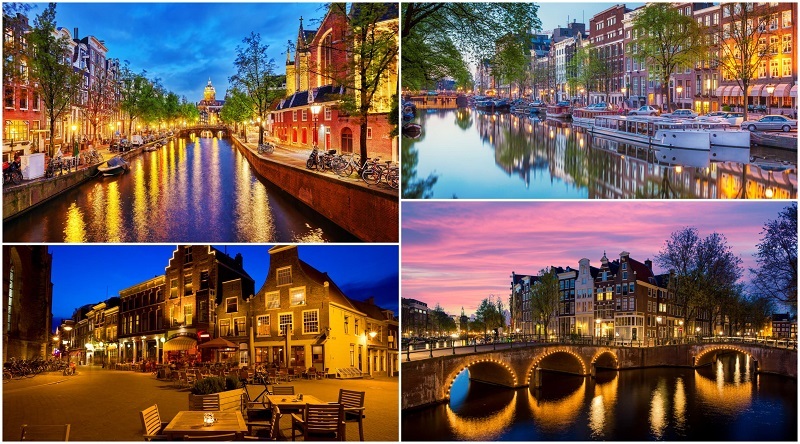 Depending on the water level on the night of your cruise, some famous landmarks you may see include Magere Brug (Skinny Bridge), Amstel River, and the Anne Frank House. Enjoy an unforgettable evening with a candlelit night cruise on Amsterdam’s canals, which are considered as UNESCO World Heritage sites. You will get to see quaint waterfront houses as you glide on Amstel River’s canal belt, and discover how the city gets livelier as the night goes deeper – with the views beautifully framed by the shimmering water. 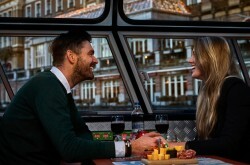 Get cozy inside a glass-encased boat as you feast on fine Dutch wine and a variety of Dutch cheeses served with other delightfully tasty snacks. Get onboard this unique train attraction in Amsterdam for a wonderful experience. This sightseeing tour includes a 4-course dinner, with each course specifically prepared in accordance with the city you are passing by. You will start the journey with a welcome drink as you prepare yourself for this adventure. 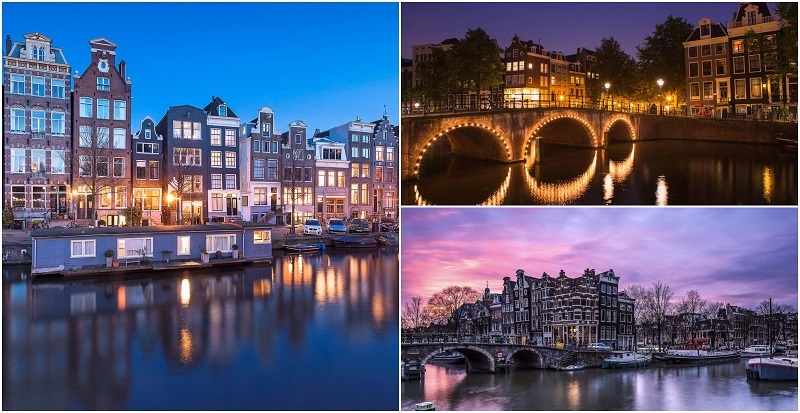 Learn more about each city with background information given on the tour, as you dine on freshly-prepared meals while enjoying the sights of the Dutch countryside. You will board the train at 7:00 pm, and the tour will last for 2.5 hours. Enjoy this exclusive experience of having dinner without the lights on – literally a blind date to remember. As you arrive at Ctaste – Dining in the Dark, you will be instructed to leave all light sources in designated lockers. The specially-prepared 3-course dinner features unique flavors and textures to make up for the lack of sight. This also encourages the use of your sense of touch, sound, and taste more fully in the complete darkness. Visually-impaired staff will guide you through the experience, which will truly awaken your other senses and give you a new perspective on how the blind go about their daily lives. Ctaste Dining in the Dark restaurant is open Wednesdays to Sundays until 11:30 pm. 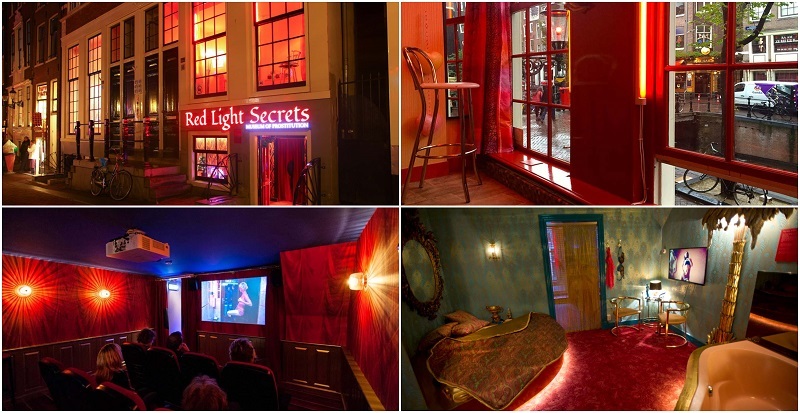 Get a glimpse of life in the red light district when you visit the Red Light Secrets Museum – the only museum of prostitution in the world. Situated in a 17th-century canal house (a former brothel) right in the center of the red light district, the museum gives you an intriguing peek into the world’s oldest profession. You will even have the chance to visit the room where a prostitute works and sit in front of the window while waiting for another client. Listen to the prostitutes’ secrets and the challenges they face, as well as visitors’ confessions of their experiences – and gain a different perspective on what the red light district truly represents. You can visit the Red Light Secrets museum daily, from 10:00 am until 12:00 midnight. 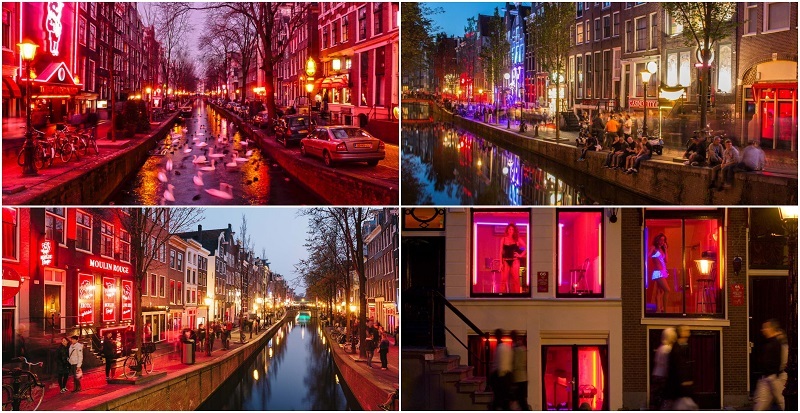 The Red Light District is a must-see attraction (and experience) when you are in Amsterdam. While it is more well-known for the adult entertainment options, there is much more to explore and have fun with in the area. There are approximately 300 one-room cabins illuminated by red neon lights, rented by the working ladies where they conduct their business, which are in the city’s Old Town. There are actually three red light districts in Amsterdam, with De Wallen being the best known and largest; the other two are Singelgebied and Ruysdaelkade. If you are looking for something out of the ordinary in the area, visit the beautiful gothic Oude Kirk (Old Church) in De Wallen, Amsterdam’s oldest building and oldest parish church. Pass through Zeedijk (“sea dike”), one of the oldest streets in Amsterdam which was once considered dangerous and where the sailors went to get their nightly entertainment. Now, Zeedijk and the red light district are filled with the vibrant energy of pubs and restaurants – and the friendly, safe vibe offers tourists and locals alike with a uniquely enjoyable experience. Be warned, though – it is forbidden to take photos of the working ladies so please respect this rule while in the red light district. The Jordaan district represents a trendier, slightly slower-paced Dutch life in Amsterdam – especially compared to the thrilling burst of energy in the other parts of the city, such as the red light district. Considered as the city’s most famous neighborhood, Jordaan is filled with a host of restaurants, bars, and unique art galleries. Visit the iconic Westerkirk church, where the remains of the artist Rembrandt are buried. Continue the nighttime Joordan district exploration to the Anne Frank House. Walk through the Flower Canal and enjoy the picturesque view surrounded by abundant leaves and floral arrangements. Go back in time and relive a piece of World War II history involving the city of Amsterdam. Make sure you visit the Anne Frank Museum and learn more about the life of one of the Holocaust’s most celebrated victims. Step into the room where Anne and her family hid for two years from the Nazi soldiers; this is also where she diligently wrote about their daily activities and struggles on a diary. The posthumously-published The Diary of a Young Girl (also known as “The Diary of Anne Frank”) became one of the most published books in history with more than 60 language versions. Visit the Auschwitz Monument, which is constructed to commemorate those who perished from the Auschwitz concentration camp (and other extermination camps) during World War II. The monument is made of broken mirrors representing the idea that “the sky is no longer unbroken after Auschwitz”. 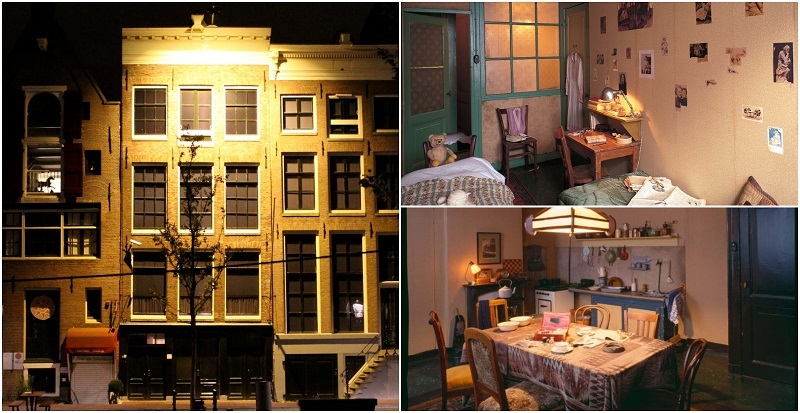 With a few date exceptions, the Anne Frank House is open daily until 10:00 pm (from 1 November to 1 April, umtil 7:00 pm; Saturdays until 10:00 pm). A coffee shop in Amsterdam is much more than just a regular cafe. This is where one can legally buy and smoke weed, with some coffee shops offering specialty products laced with weed such as space cakes or cookies. To avoid confusion, such establishments have a green and white sign outside with the words “coffee shop”. However, if you are planning on enjoying an adventure in an Amsterdam coffee shop, there are strict safety regulations that need to be followed. No alcohol is allowed (for purchase or consumption) as Dutch law prohibits the mixing of these two substances. You are also expected to buy something from the shop – either a drink or something to eat; the establishment is not purely for smoking weed. Tobacco is also banned, so mixing it with weed is not allowed. There is a limit to the weed you can purchase, and using it is restricted to the inside of the coffee shop; using the substance outside the coffee shop is illegal and will lead to an arrest. Founded in 1970, the Madame Tussauds Museum located in Dam Square at the city center is its first branch outside the UK. Get to see stunning lifelike wax figures of world-renowned celebrities in sports, politics, the music and entertainment industry, show business, and the Royal Family. Rub shoulders (quite literally) with the famous people who led prolific lives in the Golden Age of Dutch history. Get the chance to experience how it feels like to be a TV host in an interactive TV studio, where you can test out your own presentation skills! 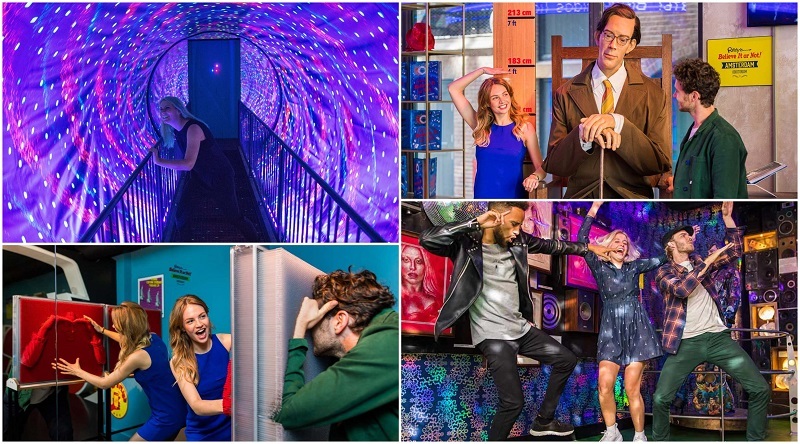 You can visit Madame Tussauds daily until 8:00 pm, with a few exceptions when the museum may close earlier or a little later. Visit the museum dedicated to the works of one of the most celebrated artists in the history of Western art, Dutch Impressionist painter Vincent Van Gogh. It is also one of the most visited museums in the Netherlands and in the world, housing the most extensive collection of Van Gogh’s work – over 500 drawings, 700 letters, and 200 paintings. Get the chance to learn more about the artist’s life and work, from his early years until the tragic end when he committed suicide due to his problems with poverty and mental illness. Marvel at the artist’s remarkable paintings of still life, landscapes, portraits, and self-portraits which often feature bold colors and brushwork. 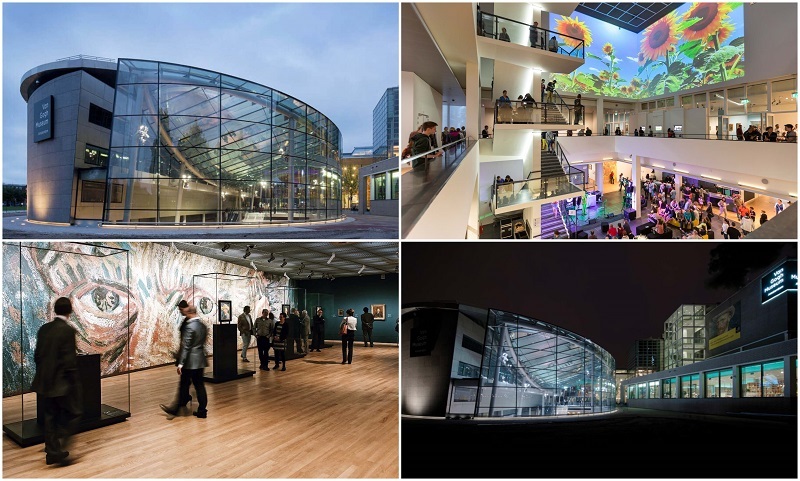 The Van Gogh Museum is open daily, Saturdays to Thursdays until 5:00 pm, and until 9:00 pm on Fridays. Ready for something new in Amsterdam? Spend some time out of the red light district and in the Amsterdam Dungeon, where you will get to relive the sinister parts of Amsterdam’s history by taking part in an interactive adventure. This unique fun attraction uses theatrical actors and cutting-edge special effects to bring you to the most hilarious or most fearful discoveries. There is no shortage of darkly funny moments with 12 interactive shows featuring the bleakest moments in 500 years of Amsterdam history. The final tours of the day, which last approximately 80 minutes each, start at 6:00 pm on Sundays to Thursdays; on Fridays and Saturdays, last tours begin at 7:00 pm. Looking for an exhibit that features something other than paintings and artwork? Check out this one-of-a-kind exhibition which shows how our physical forms are greatly influenced by our happiness. Using donated human specimens formed into whole body plastinates and translucent body slices, Body Worlds Amsterdam’s theme “The Happiness Project” will give you a clear idea of how the body functions and reacts to your happiness level. You will be amazed at the significant impact a positive outlook can have on physical health! Enjoy Body Worlds Amsterdam daily, Sundays to Fridays until 8:00 pm. On Saturdays, and during holidays & vacations, the place is open until 10:00 pm with the last admission allowed one hour before the closing time. 13/ Ripley’s Believe It or Not! Get inside one of Amsterdam’s most thrilling attractions, which can be enjoyed by the whole family. See bizarre artifacts and the equally strange stories that come with these items – are you ready to see a real, human shrunken head from the Amazon? View a real “transformer” – a 7-foot tall robot constructed purely out of car parts. Enjoy some Dutch and American refreshments while you relax at the lounge, which also offers a clear view of the Dam Square. With more than 500 artifacts and exhibits, plus 19 themed galleries, there is something to fascinate everyone in Ripley’s Believe It or Not Amsterdam. You can explore this fascinating world daily until 10:00 pm. 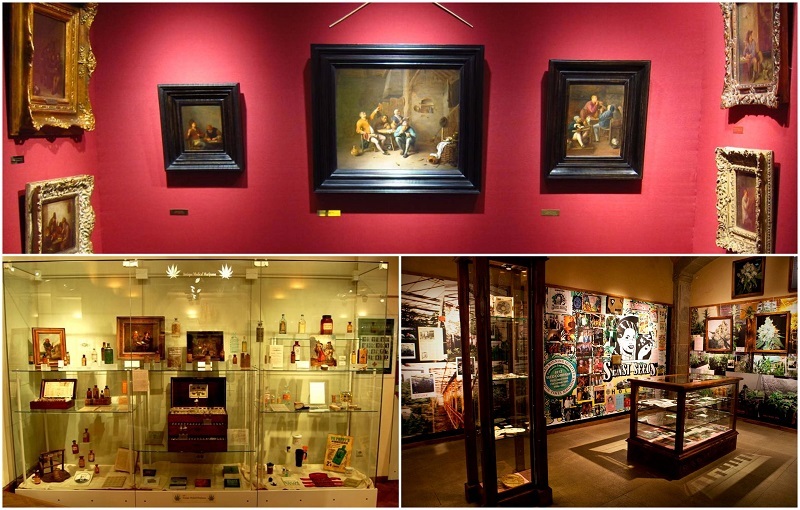 The Hash Marihuana & Hemp Museum in Amsterdam is a unique exhibition that showcases paintings & prints featuring the use of cannabis in the past, present, and future. It shows the importance of cannabis as a valuable source for a variety of purposes, such as in the development of medicine, clothing, agriculture, sea travel, and a lot more. Through this exhibition, you will discover that hemp & cannabis, which come from the same plant, have for thousands of years to date been included in daily lives. You will also get to see the largest collections of medicinal cannabis bottles in the world, dating back to the 19th century. The Hash Marihuana & Hemp Museum is open daily until 1o:00 pm. View the beauty of Amsterdam from the top, at the A’DAM Lookout. The 22-storey high observation deck gives you breathtaking 360-degree views of Amsterdam’s attractions, including the gorgeous architecture of the gothic buildings, the vibrant port area, and the intriguing canal system. Thrill seekers will have the chance to literally go “Over the Edge” – the highest swing in Europe – which will involve swinging 100 meters over the edge of the tower, with the entire city of Amsterdam spread below. 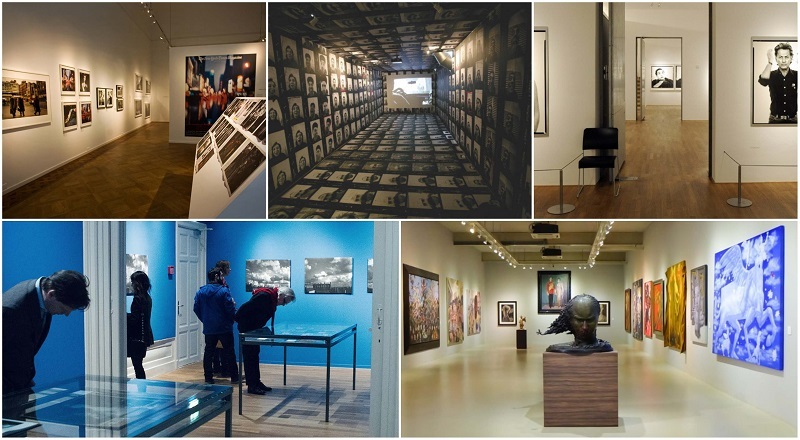 Learn more about Amsterdam’s culture and history through an engaging interactive exhibition. 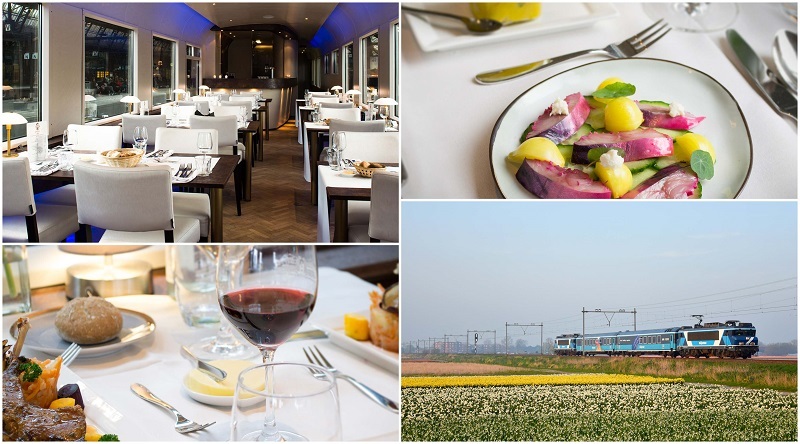 Dine and drink while you are surrounded by spectacular views of Amsterdam in the Panorama Restaurant & Rooftop Bar. 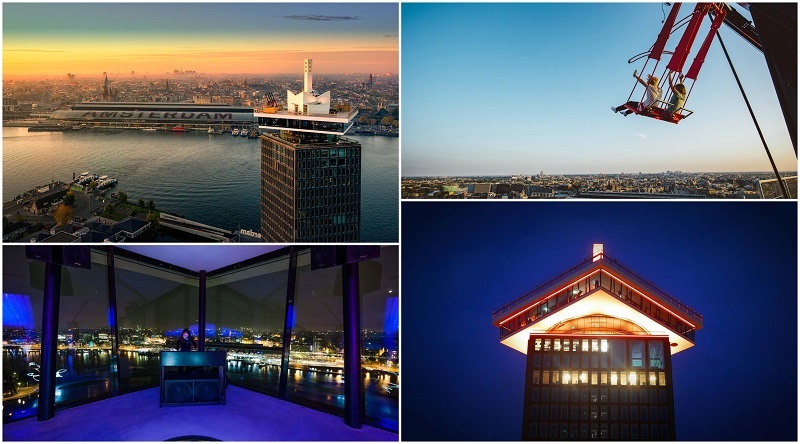 Enjoy the attractions and the view from A’DAM Lookout daily until 10:00 pm. Learn more about different facets of historical to contemporary photography at the Foam Photography Museum, which is in a beautiful canal house more than 100 years old. There are two or three international and local (photography, multimedia, and video) artists’ exhibits changed every 2-4 months, giving the audience an opportunity to view both famous and up-and-coming artists’ works. Enjoy different activities ranging from educational events, publications, exhibitions, and debates. The public educational programs organized by Foam are for the general public and professionals alike. Visit the Foam Photography Museum on Saturdays to Wednesdays until 6:00 pm, and until 9:00 pm on Thursdays and Fridays. Are you ready for the most amazing flight of your life? THIS IS HOLLAND gives you a bird’s perspective or how the Netherlands was created through a spectacular 5D experience. It will truly feel like you are soaring over the Dutch landscape, thanks to fantastic special effects, breathtaking filming, and a stunning aerial perspective as showcased in a thrilling 9-minute film. You will be part of a group of 40 people suspended under a gigantic domed screen, your feet and arms dangling to give you a realistically free experience as you “fly”. You will even feel the wind in your hair as you soar on top of the most beautiful places in the Netherlands! During winter – until 28 March 2019 – THIS IS HOLLAND is open until 8:00 pm, with the last adventure (which lasts for approximately one hour) starting at 7:00 pm. The Modern Contemporary (Moco) museum focuses on eye-opening, modern art that speaks to a wide audience. They feature artists who use irony to show their views towards modern society, making the exhibitions they showcase truly unique. The collection of contemporary art is made even more special with the often humorous and political street art of British artist Banksy. The museum is in the Villa Alsberg, a stunning mansion overlooking the Museumplein in the center of Amsterdam, at the opposite end of the square from the Rijksmuseum. Visit the museum Sundays to Thursdays until 7:00 pm, and Fridays & Saturdays until 8:00 pm. Looking for the adrenaline rush with one of the most fun things to do in Amsterdam? Try out the laser tag battle with your friends for an exhilarating time! Enjoy the intense physical activity in a 450-square meter arena, which can accommodate 20 players at a time. This game gives you the excitement of a paintball game, without the mess and the bruises. Rules and safety guidelines will be given before you start your missions in an instruction room. After that, it is time to get your laser gun and cutting-edge LED vest, so you can head on into the arena. Get ready to compare score sheets with your friends after the battle, to determine which player reigned supreme in laser tag. Experience the laser tagging adrenaline rush from Mondays to Wednesdays until 11:00 pm; Thursdays until 12:00 am; Fridays and Saturdays until 1:00 am; and Sundays until 10:00 pm. Your trip to Amsterdam will not be complete (and fun!) without visiting the old Heineken brewery in the heart of the city. This is where you will discover the Heineken family history, as well as the evolution of the logo. Go on a journey that starts with the water used in brewing beer, on to the bottling stage. It is quite mesmerizing to behold the huge fermentation tanks, and you can just imagine the millions of glasses of Heineken beer each tank can hold. Take a short, simulated city tour and take a virtual ride on an old brewery wagon pulled by Shire horses. Afterwards, there is no better way to cap off the Heineken experience than to relax and enjoy the free tasting sessions. 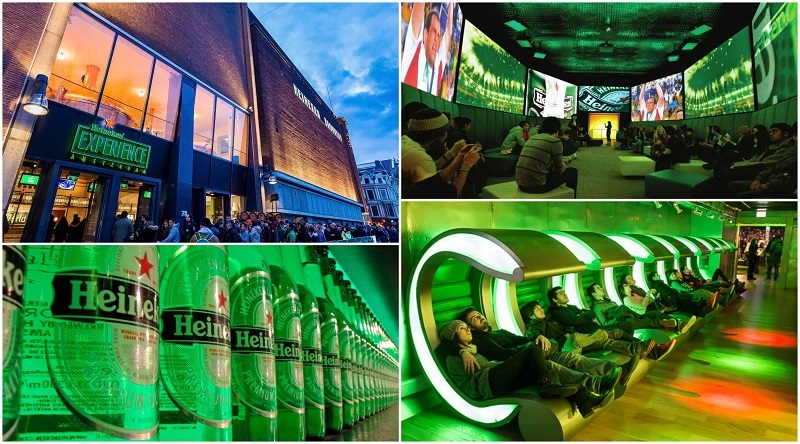 The Heineken Experience can be enjoyed daily, Mondays to Thursdays until 7:30 pm, and Fridays to Sundays until 9:00 pm. One of the most fun things to do at night in Amsterdam is to indulge in a pub crawl. This activity gives you a chance to truly experience the city’s vibrant nightlife scene as you go through some of the most popular bars and nightclubs. There are two routes you can take for the best nightlife experience in the city. Leidseplein is known as the center of Amsterdam’s dynamic nightlife scene, with pubs and clubs that will keep you partying the night away. 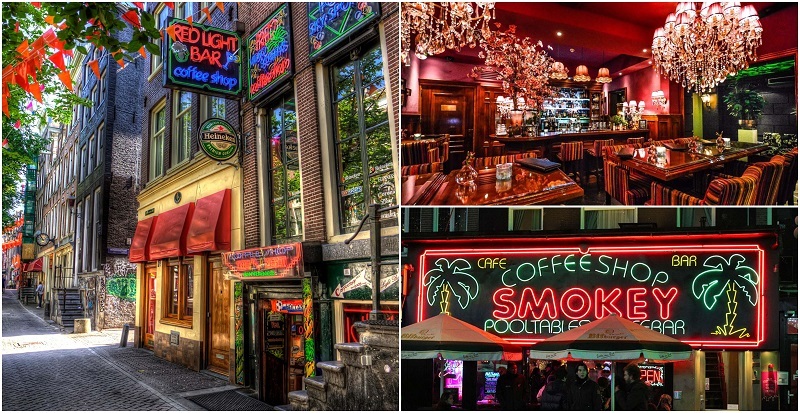 Meanwhile, the Red Light district is more than just an area where the world’s oldest profession thrives; it is where bustling bars and clubs will keep you up way past midnight with the best drinks and partying. Make sure to include this one-of-a-kind experience in your Amsterdam itinerary. 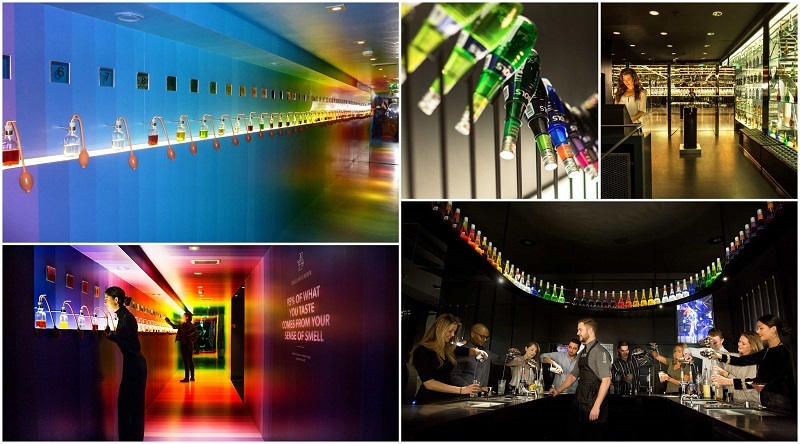 The Cocktail and Genever Experience at the House of Bols is an interactive adventure that will show you everything there is to learn about genever – the juniper-flavored traditional liquor of Belgium and the Netherlands. Although some may interchange the two, genever is different from gin, the former being the product which the latter evolved from. Learn more about cocktails, bartending, and liqueurs, and the oldest distilled spirit brand in the world – Lucas Bols. Your experience will also include a visit to the Hall of Taste for a peek at how all 38 Bols liqueurs are made, and to the Bols Genever room. Head to the Mirror Bar for your choice of liqueur and Bols Genever cocktail, as prepared by the most talented bartenders. Enjoy this adventure daily, Sundays to Thursdays until 6:30 pm, and Fridays & Saturdays until 9:00 pm. 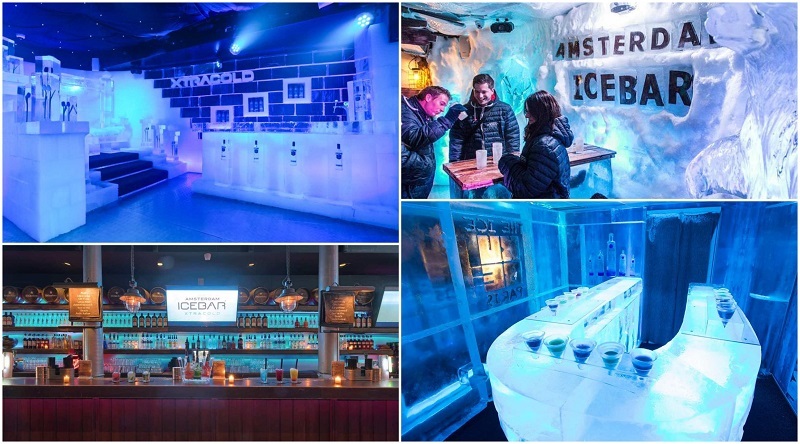 The Xtra Cold Amsterdam Icebar is the place to go if you want to cool off – literally. Everything in the bar – the bar itself, the furniture, even the art – is made completely out of ice and is kept at a constant arctic temperature of -10°C. Make sure to wear your thermal coat as you indulge on your favorite drinks served in ice glasses. Watch as the special lighting makes it appear like the ice turns into every imaginable color. Try not to look like you are slowly turning into an ice cube! Aside from the ice bar, there is a warmer area where you can just lounge and enjoy your drink while listening to music. Experience the coolest attraction in the city Sundays to Thursdays until 1:00 am, and Fridays & Saturdays until 2:40 am. The nightlife experience in Amsterdam is made even more memorable with some of the most celebrated concerts and performances. The Royal Concertgebouw in Amsterdam is one of the top concert venues in the world, renowned for its international lineup of programs and top-notch acoustics. 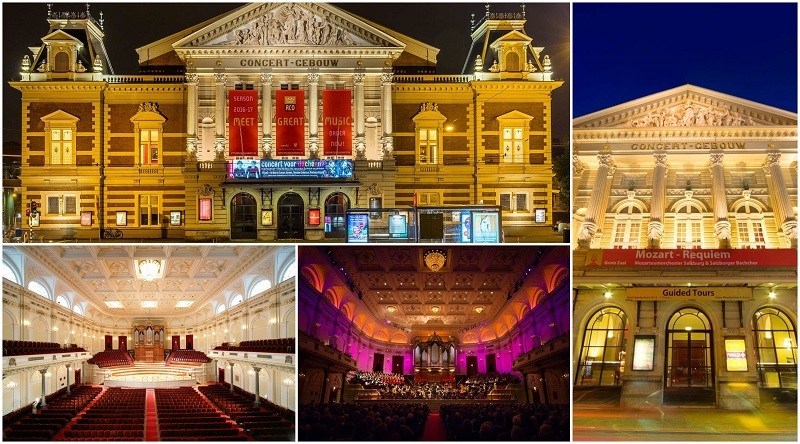 This venue is home to remarkable concerts such as the Master Pianists Series, and performances by The Bach Choir and Orchestra of the Netherlands, and the Netherlands Philharmonic Orchestra. A truly romantic ambience awaits you at the Portuguese Synagogue, where burning candles form the backdrop for once-a-month concerts featuring everything from classical concertos to Balkan folk music. Enjoy a magical experience with the remarkable acoustics of this synagogue, located in the Jewish Quarter of Amsterdam. 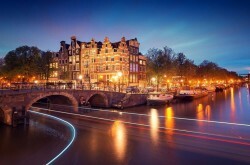 Your Amsterdam trip will take you on a fascinating historical and cultural journey that will stimulate all your senses. As you go around the city’s attractions, you will soon discover what makes this city a truly fun destination. Of course, there are many other fun things to do in Amsterdam, so if you know more, please share them in the comments below.